HafenCity, a neighborhood in Hamburg, has gained attention for its flood-proof design. Last summer, Peter van Veelen led me on a hydraulic tour of Rotterdam, an excursion along the canals, dikes, sluice gates, and cisterns that keep residents dry in an island of a city that’s mostly below sea level. Under a leaden sky, van Veelen, an urban planner, pedaled his battered three-speed. I trailed behind on a rental bike. He pointed at the red stones paving a plaza by the new central train station. A chamber below stores storm water gushing from the building’s 7-acre roof, delaying drainage into the city’s overtaxed storm-water system. And just then, heavy drops rained down, glazing the pavement and fogging van Veelen’s glasses. I’d gone to Rotterdam after a similar tour of Hamburg, which also faces flooding constantly. Big rivers pass through both — the Niewe Maas, a branch of the Rhine, in Rotterdam and the Elbe in Hamburg. Both cities, although removed from the sea, have daily tidal swings that exceed 7 feet. Rotterdam and Hamburg have each countered the ever-present threat from both salt and fresh water with remarkable success, efforts that have paid off relatively recently. For centuries, both had suffered floods. Then, following catastrophic storm surges in the mid-1900s, they constructed sturdy defenses and, in turn, became pioneers in battling rising sea levels. Few, if any, lives have been lost to flooding in either city since the mid-1960s. Yet both cities are also realistic that dangerous high water is coming. Unprecedented warming has heated and expanded sea water and assaulted mountain glaciers and polar ice caps. Researchers predict a rising sea level in both places — a rise of at least 3 feet by 2100. World leaders, convened by the United Nations, are to gather in Paris next week to work toward a treaty to slow, and eventually halt, global warming. 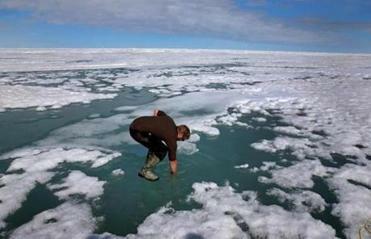 But scientists say that substantial sea level rise this century is now inevitable regardless. There’s evidence the West Antarctic Ice Sheet, containing enough water to raise sea levels by more than 10 feet, has begun an inexorable breakup, though it might take a few hundred years. Read: When island nations drown, who owns their seas? More alarming, however, is how ill-prepared the United States is for this eventuality by comparison. In Boston, developers still put up new construction at risk of flooding the day it is completed. According to a study by the Boston Harbor Association, had Hurricane Sandy reached Boston at high tide, a few hours earlier, most of the waterfront — including nearly the entire Innovation District — and many other neighborhoods would have been under 2 to 4 feet of water. “We’re responding in slow motion,” says Wendi Goldsmith, the founder and former director of the Center for Urban Watershed Renewal, an environmental group in Salem. A 6-foot rise would not only flood land adjacent to the harbor but would cascade over the Charles River Amelia Earhart dam into the basin behind it. Water would course into the Back Bay, Berger’s own MIT campus, and many other neighborhoods. If the high water was accompanied by heavy showers, a compounding torrent might stream down from Watertown, Newton, and beyond. Average sea level could be 2 feet higher in a few decades, Berger said. At that point, even a low-level, category 1 hurricane during high tide, could stir up the harbor and push waves up more than 6 feet above today’s average level. Kerry Emanuel, one of the country’s leading hurricane researchers, told the audience that such rare storms may hit Boston more frequently later this century. The region’s famous Nor’easters, which — because they approach Boston from its vulnerable easterly flank — could also become more threatening. I traveled to Hamburg and Rotterdam to see how the two European cities could be a model for the United States in preparing for the rising seas. It turns out we still have much to learn. Americans considering the Netherlands’ flood protection might conjure up coastal dikes. The Dutch have indeed armored their coastline with robust sea walls (and many miles of sand dunes). In recent decades, however, they’ve spent as much money and thought on combating water coming from elsewhere. Like Boston and many coastal cities, Rotterdam faces flooding from two sources other than the sea: Rainwater falls onto roofs, streets, and other hard surfaces; and the Rhine (like the Charles) threatens its riverbanks when upstream showers swell it. These distinct sources of water combine perniciously, a confluence of swollen tributaries. Dutch planners design for all three. Failing to address one could exacerbate the others. For instance, authorities can seal the Rhine from the sea with a huge movable barrier, but they rarely deploy it. The river needs an outlet. Van Veelen coasted past the entrance to a new parking lot built below the Museumpark, Rotterdam’s cultural heart. A 2.6 million-gallon storage chamber — the volume of four Olympic pools and the largest underground tank in the Netherlands — lies underneath the parking levels. The receptacle, like the chamber by the railway station, buffers downpours. Van Veelen pedaled onward, out onto an avenue atop a broad berm, the dike that protects Rotterdam when storms raise the Rhine’s headwaters. The road veered left, and the dike widened into a verdant esplanade, overlooking Rotterdam harbor. Children frolicked in an artificial rivulet cascading down benches of black stone. We had arrived at a multifunctional dike, a new idea that van Veelen is studying, for disguising unsightly flood protection by giving it a secondary purpose, such as a parking garage or shopping areas. An electronics retailer, a supermarket, and a pet shop filled a new strip of shops directly beneath our feet. I couldn’t help but thinking how perhaps Boston’s Innovation District or Charles River shore might someday be aesthetically buttressed with such a fortification. Though famous for keeping out water, many Dutch engineers now preach living with it. “Fighting water is a war you can never win,” says Henk Ovink, the Netherlands’ Special Envoy for International Water Affairs and an enthusiastic booster of Dutch expertise. “You have to learn to live with it.” Dutch firms are building aquatic homes to populate floating neighborhoods. They’ve designed amphibious houses with yards that serve during downpours as storage basins. One Dutch firm has announced plans to build the world’s first floating multistory apartment building. In Boston, developers still put up new construction at risk of flooding the day it is completed. This new idea of living with, rather than fighting, water has sometimes required the Dutch to remove earlier protection. On Oct. 12, under sunny skies, the Dutch minister of the Infrastructure and Environment presided over a ribbon-cutting ceremony celebrating the completion of the $300 million Ontpoldering Noordwaard project. It’s one of the last elements of Room for the River, the audacious, $3 billion project for making peace with the Rhine and two other freshwater arteries that periodically rise up and intimidate Rotterdam and nearby cities. After working so long and hard to confine rivers to narrow channels, Dutch engineers are expanding flood plains by digging riverbeds deeper, moving constraining floodwalls farther apart, and, in some cases, removing dikes completely. The Noordwaard project was large and complex. Construction crews had pulled down a mile of levee between the Rhine and a 17-square-mile basin that had been farmed on and off for hundreds of year. Bulldozers and backhoes had dug up more than 100 million cubic feet of dirt while installing dozens of bridges, culverts, and pumping stations. To make the land suitable for flooding, crews had demolished 50 houses and barns. Now the Rhine pours over its renovated banks every high tide. In the spring, when ice melts in the Alps, and when storms drench the watershed, the basin fills up. The huge enclosure holds enough water to lower a flood by about a foot. It reduces the risk of downstream inundation in urban centers such as Dordrecht, one of the Netherlands’ oldest cities and, to a lesser extent, Rotterdam. Albeit widely recognized as being at the forefront of flood control, the Dutch have no monopoly on how to confront sea level rise. Two hundred and fifty miles northwest of Rotterdam, Hamburg has its own coterie of planners and engineers thinking up innovative ideas. The German urban planner Thorsten Gödtel last July led me on a swing through HafenCity, a Hamburg quarter rising on two connected islands in the Elbe that has gained widespread attention for its flood-proof design. Gödtel said that on Nov. 9, 2007, just as a North Sea gale sent an 18-foot surge of water up the river, he’d taken a seat inside a cafe in a new building there. As he sipped a cappuccino, the turbid river rose outside, creeping up the establishment’s extra-thick windows, and temporarily turning the cafe into an aquarium. Later, he’d exited the building onto the street through a door one flight up, without even wetting the soles of his feet. Once a gritty industrial zone, HafenCity is one of Europe’s largest developments, a neighborhood of glittering trophy buildings for commercial and residential use. Although it’s only 30 percent complete, it already hosts about 2,000 inhabitants and 10,000 workers. About a decade ago, before razing a power plant and warehouses then occupying the land, the city drafted special rules for new construction. At the time, the Elbe often flooded the future HafenCity; planners anticipated worse conditions in the future. Yet rather than fortifying the shoreline with dikes, the city specified that bridges to the mainland and roads — in other words escape routes — should be raised on sand plateaus 25 feet above sea level. The shoreline was left at its original elevation — the “promenade level,” just above high tide — giving residents and visitors unobstructed access to and views of the river. But buildings, such as the one where Gödtel had taken his coffee, were required to be waterproof up to the safe street elevation. Their doors had to close like ship’s hatches when necessary. At least until mid century, inhabitants of HafenCity need have no fear whether it rains or it pours. HafenCity inspired one of 50 plans submitted earlier this year to the Boston Living With Water design competition for responding to sea level rise. Arlen Stawasz, a designer at the architecture firm Perkins + Will and one of the entry’s authors, calls HafenCity “a whole new way to live with water.” It’s “about not keeping water out but keeping water in and embracing it,” he said. Could other European ideas for responding to sea level rise and heavier rainfall help Boston? Wendi Goldsmith, who has visited Hamburg and Rotterdam and written about post-Katrina New Orleans, says yes. She foresees the multifunction dikes like Rotterdam’s might someday fortify South Boston’s coast. Buried cisterns might delay the flow of storm water into the Basin. Goldsmith notes that in at least one regard, Boston has out-Dutched the Dutch. “We’re already practicing Room for the River,” she says. The Charles was never hemmed in by dikes so, unlike the Rhine, there are no flood walls to tear down. Daniel Grossman is a science journalist specializing in climate change. His reporting in Germany and the Netherlands was supported by the Whole Systems Foundation and the Pulitzer Center on Crisis Reporting.